Contemplation and creation, they go hand in hand. This is so because “the mystery of creation is the mystery of God, of God who reveals Himself.” The entire created universe perennially and harmoniously sings of the glory of God. The contingency of the creature proclaims the absolute and necessary Being of the Creator, and every creature, in its own way, is a small, yet real manifestation of the generous love of the Creator. In fact, as Christians we not only believe that God is the “Creator of heaven and earth,” but that “God is charity” (1 Jn 4:8). In the one true God there is eternal, essential love in the communion of Three Divine Persons. God the Trinity’s free, creative act, therefore, is an act of divine love; He loved us into existence and in Christ He sustains us in being (cf. Col 1:17). Thus creation is both the bond and distinction between Creator and creature; it is that “kiss” between two metaphysically distinct realities: the infinite, eternal God and His finite, temporal creation. Consequently, the divine formation of man “from the beginning” (Mt 19:4,8) is of great importance to our way of thinking, acting and praying because it touches not only on God’s creation in general, but centers on Adam, His creative masterpiece. How did God create the body of the first man? Was it literally “from the slime of the earth” (Gen 2:7), that is, from the raw elements by way of the direct, divine formation of Adam’s body? Or did God create Adam’s body through a prolonged, assisted evolutionary process and then, at some point, transform a non-human body into a human one and breathe a human soul into it? Now it is in no way apparent how such an opinion [polygenism] can be reconciled with that which the sources of revealed truth and the documents of the Teaching Authority of the Church propose with regard to original sin, which proceeds from a sin actually committed by an individual Adam and which, through generation, is passed on to all and is in everyone as his own. In a nutshell, on the subject of the evolution of man Scripture, Tradition and the Magisterium restrict Catholic scientists and theologians to a cautious discussion of the formation of the body of the first, individual man (Adam) by God. In other words, in forming the body of the first man, father of the entire human race, did God create His body using an evolutionary process or did He simply create the body of man directly without intermediate phases? The scope of this study, therefore, is extremely limited: to wit to present a coherent argument based on fittingness for the direct creation of man by God de limo terrae without any evolutionary process. Like the discussion at the time of Bl. John Duns Scotus on the Immaculate Conception, there are basically two options: either there is an immediate creation of Adam’s body by God or there is not. Potuit: God could have created man’s body immediately and directly from the earth; decuit: it was fitting that He do so; ergo fecit: therefore He created Adam’s body de limo terrae. When we speak of the Catholic doctrine on the special creation of the body of the first man there are, at present, two basic schools which I will call ‘creative maximalism’ and ‘creative minimalism.’ In the maximalist camp God is seen as having created the first man’s unique body from the elements of the earth directly and immediately; the key words here are direct and immediate. In the minimalist camp He is seen as a divine Administrator directly overseeing the formation of Adam’s body through an evolutionary process, all the while maintaining that God at the last moment intervened with His creative action to transform this animal body into a human body and infuse the human soul into it. Could God have created man according to the maximalist view? That God the Almighty who created heaven and earth ex nihilo could have created the body of the first man directly and immediately from the pre-existing matter of this world seems obvious. Let us, however, at least briefly establish a solid potuit argument. First, God is Omnipotent. In His infinite power He effortlessly created the universe with all of its laws and rhythms; it goes without saying that He Himself is not subject to these laws, but utterly transcends them and can change or adjust or erase them according to the desires of His will. He is the Author of all finite being and is perfectly, divinely free in writing His book of creation. “Nothing shall be impossible with God,” declares St. Gabriel (Lk 1:37). This also means that just as creation came into being at His bidding, so it can just as readily cease to be. If He were to cease to sustain all contingent beings in existence they would cease to exist instantly, effortlessly. At His word there would be no recollection of any created being having existed, no trace whatsoever. Given these absolute, divine powers of God, clearly He had no need for any evolutionary process to create man’s body or any other corporeal species. He was quite capable of creating the individual species of creation directly and immediately either ex nihilo or de limo terrae. Second, and this ties in with the first point, if God created the physical universe out of nothing, if He created the Angels out of nothing, if He created the soul of Adam and continues to directly and immediately create the soul of every human person out of nothing, then this demonstrates anew that God, while He could have used an evolutionary process in forming the body of the first man, was quite capable of forming that body without any mediatory process. While other arguments could be posed, these two should be sufficient for our purposes. Hence, God could have formed the body of the first man from the earthly elements directly and immediately. This possibility, in and of itself, does not exclude theistic evolution, but rather serves only to say potuit: God could have formed Adam’s body without any evolutionary process. We now arrive at the heart of this study where, with the help of God’s grace and some diligence of thought, solid theological arguments will be offered in favor of the fittingness of the creation of Adam’s body by God from “the slime of the earth” as opposed to its creation from a brute beast through an evolutionary process. Presenting the fittingness of the maximalist view will at times involve an exposition of the unfittingness of the minimalist view. This is not to say that the latter is per se heretical since, as noted, the window of discussion on both sides presumes the special divine creation of Adam’s body. Whether created from clay or critter, God is maintained as the Creator. To facilitate this we will look at the decuit arguments in relation to God the Creator, Adam the creature, and Christ who is both Creator and creature united in the Person [υπόσταση] of the Word. Creation, by its very nature, inspires awe and wonder; but more importantly it leads us to revere and adore the Creator. With this in mind, given the choice which is presently acceptable within the Church between the creation of Adam’s body by the direct intervention of God from the dust of the earth or a sort of ‘administrative overseeing’ of the development of that body through prolonged evolutionary phases with a final, ontological transformation of an essentially animal body into a human one, there are many thoughts which should flood our mind. The creation narratives have God as their primary Author. They display a marvelous simplicity coupled with a magnificent power and transcendence. Since God is both simple and all-powerful, the accounts are coherent. Creating the first man as indicated in Genesis confirms these two characteristics of the Creator. God creates the first man, and He does this simply and powerfully. The theory of evolution in and of itself is extremely complex and riddled with problems. Coupling it with the doctrine of God’s creation of one man, Adam, makes it exponentially more complex. Let us look briefly at what a Catholic must uphold if he is to favor the theory of theistic evolution. A) He must maintain that God, who created the physical universe instantly and effortlessly out of nothing, used and oversaw a prolonged and complicated evolutionary process to arrive at an animal body similar to man’s; B) Given the essentially different nature of man’s body both physically and spiritually, that animal body would have had to have been transformed in its very essence by God before infusing a soul into it; C) Since polygenism is in direct contradiction to the divine revelation about the creation of one man and the original sin of that one man which was passed on to his progeny, a Catholic would have to sustain that the entire evolutionary process used by God culminated in the transformation of one, single animal body into the first Adam, father of the entire human race. A Catholic doctrine of theistic evolution would also create many practical questions which show the unlikelihood of it being true. For example, when the evolutionary process terminated and God transformed the body of one beast into our first parent, what was Adam’s relationship with his original mom and dad and kin? Regarding the race of animals used in the evolutionary process, did they continue to evolve physically? If Adam was formed from a gorilla or a chimpanzee or any other animal, are he and his children permitted to procreate with animals?… After all, according to theistic evolution, these animals bred, nourished and prepared the body that God would use to form Adam, perhaps even over a period of millions of years, right? In a word, the theory of the biological macro-evolution of man and the doctrine of man’s special creation by God multiply rather than eliminate questions about the origin of man. On something as fundamental as the formation of man’s body – a body which He Himself would one day assume in the womb of the Virgin Mary – is it even imaginable that God would have left the real story of its creation encrypted in fossils only to be discovered and revealed to us through the theories of geologists and empirical scientists? The Creator, the personal God of the covenants, the God who sends His Son to save us, is a God of power, wisdom and love who can neither deceive nor be deceived. Yet nowhere in the entire Bible does it even suggest that God made man from an orangutan or through an evolutionary process. Although it is not the scope of this presentation to engage in an in-depth study regarding divine revelation and the formation of Adam’s body, nonetheless, it seems opportune to briefly deal with two attempts made by creative minimalists to use Scripture and Tradition in their favor. First, they will sometimes make reference to the following Scripture verse: “He that liveth for ever created all things together” (Ecc 18:1). In itself this phrase proves nothing; however, when taken out of context and used in a discussion defending theistic evolution it is sometimes accommodated to justify their position. Ironically, when seen in its original context we discover that Solomon in the previous chapter explicitly states that “God created man of the earth [de terra], and made him after His own image” (17:1). Furthermore, in the verses that follow it we discover that Solomon was at the same time demanding faith in the Almighty Creator and humble reserve in trying to figure out how God accomplished this glorious work. In context it reads: “He that liveth for ever created all things together. God only shall be justified, and He remaineth an invincible king for ever. Who is able to declare His works? For who shall search out His glorious acts?” (vv. 1-3). In its immediate context, therefore, the very reference the minimalists utilize to defend their position actually confirms the opposite and demands a humble recognition of the limits of scientific study before the majestic work of God’s creation. The elements of this corporeal world have also their well defined force, and their proper quality, from which depends what each one of them can or cannot do, and what reality ought or ought not to issue from each one of them. Hence it is that from a grain of wheat a bean cannot issue, nor wheat from a bean, nor a man from a beast, nor a beast from a man. In other words, according to Augustine the seeds, created directly by God, developed according to their pre-assigned form: the seed-form of the tree could never become a fish; that of the bird could never migrate into a giraffe; and obviously the seed-form of the ape family could never in a million years evolve into humanity. St. Paul, in fact, uses the analogy of seed planting to explain the resurrection, attention being drawn to the clear distinction between the various species: “And when thou sowest,” he writes, “thou dost not sow the body that shall be, but a bare grain, perhaps of wheat or something else. But God gives it a body even as He has willed, and to each of the seeds a body of its own. All flesh is not the same flesh, but there is one flesh of men, another of beasts, another of birds, another of fishes” (1 Cor 15:37-39). Consequently, if this Augustinian notion of rationes seminales were to be accepted, it could never be considered as a type of theistic evolution. He in no way suggests that man, and in particular the first man, gradually, corporally evolved from the animal world, but rather explicitly excludes such a possibility. When God created man, He did so in a way different from the rest of creation. This was the climax of His creative handiwork: “And He said: Let Us make man to Our image and likeness[…] And God created man to His own image: to the image of God He created him: male and female He created them[…] And God saw all the things that He had made, and they were very good. And the evening and morning were the sixth day” (Gen 1:26-27, 31). Permit me to make some analogies which may serve to indicate, albeit in a limited way, the fittingness and likelihood of God not using an evolutionary process to create Adam’s body. Imagine Automobili Lamborghini S.p.a. taking an old, used grocery cart to produce their latest sports car! Or NASA taking one of the Wright Brothers’ first airplanes and transforming it into the latest space shuttle. Sure, one could argue that a modern piece of technology could be produced by completely modifying an outdated one, but experience and logic show that the special production of the latest state of the art technological gadgets demands starting from scratch. While the analogies are ludicrous in themselves and may seem exaggerated for our purposes, nonetheless, theistic evolution is actually more extreme than these, not in the sense that God could not have developed Adam’s body through an evolutionary process and then modified it into His creative masterpiece, but because instead of the special formation of Adam’s body from the elements of the earth we have a radical transformation of an animal body into a human one, and this after a prolonged evolutionary process. The revelation of God creating man from humus leads us to humilitatem, to that humble attitude of adoration towards our Creator who so marvelously made us. In fact the Latin word religio comes from the verb religare, to bind anew. The Judeo-Christian tradition, because of the unique divine revelation it has received regarding creation, does just this: it rebinds us to the Creator; it renews that covenant with Him who created the world out of nothing and created man in His image from the dust of the earth. Our religion is, in a particular way, a living out of that original covenant-bond that God established with man in creating him in His own image and likeness, a covenant-bond which Adam ruptured through original sin and which has been restored again by our having been redeemed and created anew in Christ Jesus. To the contrary, the notion of man coming from the great apes causes disgust and, ironically, pride. At first, the very thought of it is repugnant; it is a monstrosity. This alone indicates that the theory is not befitting of the all-powerful, wise and loving God revealed to us on every page of Holy Writ. And yet, after the initial reaction, the theory begins to offer a certain fascination, a temptation to pride. Instead of falling down in adoration of his Creator, he falls into adulation of himself. He begins to think that he is the elite one, the survivor of the fittest in this ongoing evolutionary process. He may even consider himself to be enlightened, to be above the rest, to be one of those who is on the verge of some new, higher form of life. Thus neither the initial dismay at primate parents nor the subsequent pride of being among the progressive illuminati of the human race leads man to humbly adore God the Creator. Why? Because at the origins there is no “covenant-bond” with the Creator, but rather a process, and the logical end of macro-evolution does not point to the final destination of all men, namely God, but rather points to constant progression and evolution. It all rings of the original temptation: Eat of this delightful fruit and “your eyes shall be opened: and you shall be as gods” (Gen 3:5). In Psalm 8 King David exclaims, “O Lord our Lord, how admirable is Thy Name in the whole earth! For Thy magnificence is elevated above the heavens. […] What is man that Thou art mindful of him? or the son of man that Thou visitest him? Thou hast made him a little less than the angels, Thou hast crowned him with glory and honour” (Ps 8:5-6). The sublime dignity of the human person as created by God is announced throughout the Bible. It is precisely this elevated status of man that deserves our attention if we are to grasp the fittingness or not of his being created directly and immediately by God from the earthly elements. Man’s unique dignity and place in all of God’s creation lies in this fact: he alone was created in “the image and likeness” of God. In both of the creation narratives it is clearly revealed that man, from the outset, was essentially different from all of the rest of God’s creation. In fact, every other plant and animal is named by and subjected to man because God created all things for man, just as He created man for Christ (cf. 1 Cor 3:21-23). Of all visible creatures only man is “able to know and love his Creator.” He is “the only creature on earth that God has willed for its own sake,” and he alone is called to share, by knowledge and love, in God’s own life. It was for this end that he was created, and this is the fundamental reason for his dignity. An obvious question arises: if man alone has such a high dignity in all of creation; if he alone was willed in sui iuris; if all of the rest of creation exists for him; then would it be fitting for God to use the body of an undignified animal to create the dignified body of our first parent? It seems fitting that there be something very special, “very good” in how God formed the body of our earthly forefather before breathing the human soul into it. Perhaps the greatest difficulty of the theory of evolution regarding the formation of man’s body is this: the body of man is not just another animal body. No matter how similar the human body might seem to the bodies of certain animals, the body of Adam and his progeny is essentially different. Why is this? The Catechism of the Catholic Church teaches us that “spirit and matter, in man, are not two natures united, but rather their union forms a single nature.” In other words, the body of man is intrinsically ordered to the personal, immortal soul which it receives directly from God. This is the fundamental reality of man and thus the key to an authentic anthropology. An animal body, to the contrary, is neither ordered to nor disposed to a personal, immortal soul. No animal body, no matter how evolved, no matter how similar to that of a homo sapiens, can make a qualitative leap from a mortal, impersonal, corporal substance to a human body which is incomplete without an immortal, personal, spiritual soul. In Adam, by his very human nature, body and soul are united and ordered to one another; they are incomplete one without the other. For this reason alone it does not make sense that God would have used an evolutionary process utilizing monkeys to form the human body of Adam. A quick example might help to illustrate the point: a manual typewriter can simply never become a computer; while the keyboards may look the same, they are essentially different and no matter how one might try, the nature of a typewriter – which is complete in itself – and the nature of a computer, which has parts ordered one to another, are essentially different. You simply can’t take a manual typewriter, add a screen and place a hard drive next to it and expect it to change its nature. Obviously, God the all-powerful could have taken the body of a chimpanzee, complete in itself and essentially different than a human body, and He could have transformed it into a human body which is essentially incomplete without and ordered to the personal soul. If He did do it in this way, science would never be able it to show us this. Why? Because we would be dealing with a one time divine intervention and not a natural process viewable under a microscope. Knowledge of this would require a divine revelation. Fossils don’t show the spiritual nature of man; besides, after the transformation of the beastly body into the human body of Adam, there would be no traces of this divine action since Adam would no longer be a beast, but a man; even if we found his skull, how could we know from his human skull that God divinely, essentially transformed it from what it was not into what it was? Creating the body of Adam from the slime of the earth accomplishes two things that an evolutionary process and transformation do not. First, it respects the dignity of the human person created; second, it maintains the clear distinction between the Creator and creature so that man, while created specially to the image and likeness of God, can always repeat to himself God’s words to Adam: “for dust thou art, and into dust thou shalt return” (Gen 3:19). Being in the image of God the human individual possesses the dignity of a person, who is not just something, but someone. He is capable of self-knowledge, of self-possession and of freely giving himself and entering into communion with other persons. And he is called by grace to a covenant with his Creator, to offer him a response of faith and love that no other creature can give in his stead. Since human nature, and thus the human person, is a composite nature of body and soul, it is fitting to his God-given dignity that both the body and soul of the first man be created directly by God in their pristine dignity. From the beginning Adam in both body and soul lived in the state of original justice and innocence. But if his origins were not through a direct creation by God de limo terrae, how could we speak of an original justice and innocence? It would be, yes, a God-given justice and innocence; but it would not hearken back to the origin of the creation of his body which, before God’s intervention was ever evolving and finally transformed. Second, creation from the earth by God keeps man in a true state of humility. To say that man comes from an orangutan is not humbling; it is outright degrading. And, ironically, instead of fixing man in a state of humility before his Creator, it tends to fix his gaze arrogantly upward because he forms part of an ever-ascending evolutionary process. He is tempted to disregard his created status and to think, “What will the human race become?” As such it feeds an elitist spirit, even a spirit of pantheism, things which Ash Wednesday’s “remember, o man, that thou art dust and unto dust thou shalt return” keeps in check. I will touch upon this again from a Christological perspective, but I do not want to neglect making a simple point here. If we say that Adam’s body was created by God from the earth with its original dignity, then we clearly see the dignity of Eve. After God created her from Adam’s rib, Adam exclaimed: “This now is bone of my bones, and flesh of my flesh; she shall be called woman, because she was taken out of man” (Gen 2:23). On one level, as Scripture and Tradition confirm, this is the basis for woman being subordinate to man; on another level, it shows her great dignity as a person. She, like Adam, was created in an immediate, direct way by the Creator as a human person. Together, in their complementarity and their uniqueness, God created them to His image (cf. Gen 1:27). Eve’s dignity is clearly seen in her unique creation from Adam, the first human person. But if Adam was created by God from a gorilla, and Eve was created from a human person, it would follow that Eve’s creation was more sublime and dignified than Adam’s. And, in the end, it would actually insult woman’s dignity because her origins would be from the side of a transformed ape. Up to now I have focused on man’s nature in itself and his personal dignity, but Adam’s body was created, together with his soul, for a supernatural end. St. Paul, when upbraiding the Corinthians for their repeated sins of the flesh, appeals to their supernatural call. “Now the body is not for immorality, but for the Lord, and the Lord for the body… Do you not know,” he writes, “that your members are the temple of the Holy Spirit, who is in you, whom you have from God, and that you are not your own? For you have been bought at a great price. Glorify God and bear Him in your body” (1 Cor 6:13, 19-20). Note that the Apostle is making an appeal to the supernatural end of man’s physical body in correcting sins of the flesh. Adam, in the state of original justice, was the first physical temple of the Holy Spirit. Before original sin he walked with God in the earthly paradise. This elevated dignity of man’s body as the “temple of the living God” (2 Cor 6:16) distinguishes it essentially from the entire physical universe. His body, then, is on a different level than rocks, plants and animals because it has been created by God to be a vessel of grace, as the Holy Apostle points out: “But we carry this treasure in vessels of clay, to show that the abundance of the power is God’s and not ours” (2 Cor 4:7). Therefore, it would seem unfitting that God use the natural body of a beast to form the temple of Adam’s body. Unlike the rest of the physical universe, the body of man is oriented towards resurrection. While man’s soul is immortal, his body, like a seed which will fall into the ground and die, will be raised up on the last day. This was the faith and hope of the woman in Machabees who encouraged her seven children to prefer cruel death than sin. In fact, as the second son was being tormented to death he cried out, “The King of the world will raise us up, who die for His laws, in the resurrection of eternal life” (2 Mac 7:9). Interestingly, when St. Paul teaches that man’s body is ordered to the resurrection he specifically refers to Adam’s formation from the earth: “The first man was from the earth, earthy; the second Man is from Heaven, heavenly” (1 Cor 15:47). Note his confirmation of Genesis on man’s creation de limo terrae. At any rate, this first Adam, along with all of his progeny, was destined for the resurrection. “Behold, I tell you a mystery,” the Apostle writes, “we shall all indeed rise” (1 Cor 15:51). Our bodies are created with a view to resurrection in Christ. Like a grain of wheat, they will die and bring forth fruit (cf. Jn 12:24). On this score, we note that Jesus chose to abide with us and give Himself to us as real food and drink: “He who eats My flesh and drinks My blood has life everlasting and I will raise him up on the last day” (Jn 6:55). The body of man, therefore, has a supreme dignity in that it is called to physical communion with the Incarnate Word even during this life. This is more than just a spiritual union on the level of grace; it is a “partaking of the Body of the Lord” (1 Cor 10:16) which makes us one body in Christ. 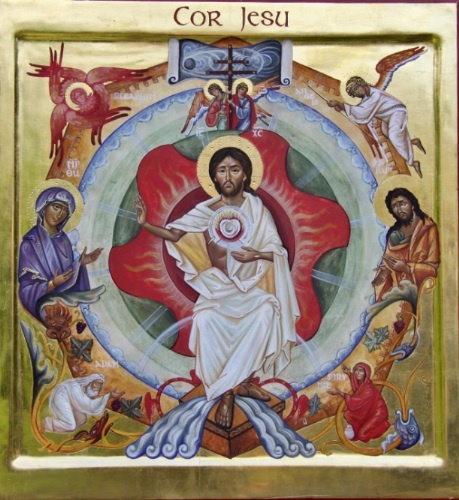 The body of man is not only oriented to the resurrection on the last day, but to being one with Him who is “the Resurrection and the Life” (Jn 11:25) even during this time of earthly exile. Indeed we are called to abide in Him and He in us (cf. Jn 15:3) with our entire human nature, that is, in both body and spirit. For this reason it was fitting that God create Adam’s body directly, without any evolutionary process or transformation. While the evidence above should be more than sufficient to say, decuit, nonetheless the most sublime and beautiful arguments in favor of the traditional view lie in the fact that the Creator, whom the world could not contain, chose to be contained within the mortal frame of a human body. “When the fullness of time came, God sent His Son, born of a woman” (Gal 4:4). As was noted earlier in speaking of man’s resurrection where Christ is called the “last Adam” who will raise up the “first Adam” and his progeny, so St. Paul speaks elsewhere of Adam as “a figure of Him who was to come” (Rm 5:14). The entire mystery of man, starting with the first man, is to be seen in Christ. In reality, Adam was made with Christ in mind. Hence he and the entire human race are understood only in the light of Christ. Even Adam’s sin is seen in the light of Christ’s superabundant grace. St. Paul tells us that the human race takes its origin from two men: Adam and Christ. . . the first man, Adam, he says, became a living soul, the last Adam a life-giving spirit. The first Adam was made by the last Adam, from whom he also received his soul, to give him life… the second Adam stamped His image on the first Adam when He created him. That is why He took on himself the role and the name of the first Adam, in order that He might not lose what He had made in His own image. The first Adam, the last Adam: the first had a beginning, the last knows no end. The last Adam is indeed the first; as He Himself says: “I am the first and the last” (Apoc 22:13). What is important for our subject is this: the human body of Adam was formed with the Incarnation in mind. If all creation is created in Christ and for Christ (cf. Col 1:16; Jn 1:1-2; etc. ), this holds true in a particular way for man whose human nature, both body and soul, is to be assumed by Christ in the Incarnation. The dignity, therefore, of the human body is divine because in Christ, the second Adam, will dwell “all the fullness of Godhead bodily” (Col 2:9). The human body is destined for θέωση, a Greek term which is frequently translated as divinization or deification, because, as St. Peter points out, through Christ we are able to “become partakers of the divine nature” (2 Pt 1:4). Or, as St. Paul puts it in broader terms, “For you know the graciousness of our Lord Jesus Christ – how, being rich, He became poor for your sakes, that by His poverty you might become rich” (2 Cor 8:9). The Divine Liturgy of both the East and West emphasizes this elevation of man to the divine life because of the Incarnation of the eternal Word. Man’s body, therefore, was created precisely with the Incarnation of the Word in mind and man’s subsequent divinization in Christ. The whole notion of an evolutionary process and final transformation of a beast into the first Adam is clearly not fitting to the human nature of the King of kings and the Lord of lords. Let us never forget that at the origins of man we do not find a phenomenon, but rather Jesus Christ who is Himself “the beginning of the creation of God” (Apoc 3:14). From the old Adam / new Adam parallel there was also the Marian parallel of the virgin earth. This parallel began with the Church Fathers (St. Irenaeus, St. Ambrose, Tertullian, St. Ephraim) and continued through the ages in the writings of Saints and theologians (i.e. St. Bonaventure, St. Louis de Montfort, St. John Paul II, etc.). This teaching, which confirms Christ’s virginal conception and Mary’s virginal motherhood, can be summed up thus: just as Adam was formed by God from the virginal earth of the earthly paradise, so the New Adam, Jesus Christ, was formed by God from the virginal earth of Mary, the new paradise of delights. Suffice it to say that a great patrimony of theological thought from the Apostles and Church Fathers to our own day builds and depends upon the creation of Adam de limo terrae. In fact, if we tinker with God’s revelation about the creation of man it sets the entire deposit of Faith in tilt. Hence, with the modern belief in the “infallibility” of the empirical sciences and the “fallibility” of Scripture and Tradition, the words of our Lord begin to ring true, “Yet when the Son of Man comes, will He find, do you think, faith on earth?” (Lk 18:8). The Catechism of the Catholic Church directly links man’s being an image of God to the fact that he is the image of Christ: “Man is predestined to reproduce the image of God’s Son made man, the ‘image of the invisible God’ (Col 1:15), so that Christ shall be the first-born of a multitude of brothers and sisters (cf. Eph 1:3-6; Rom 8:29).” Consequently, man’s creation in both body and soul not only reflects how Christ will be formed from the Virgin Mary, but is accomplished with Christ in mind. Man, male and female, shared from the beginning in this supernatural gift. This bounty was granted in consideration of Him, who from eternity was beloved as Son […] This supernatural endowment, which took place before original sin, that is, the grace of justice and original innocence – an endowment which was the fruit of man’s election in Christ before the ages – was accomplished precisely in reference to Him, to the beloved One, while anticipating chronologically His coming in the body. In the dimensions of the mystery of creation the election to the dignity of adopted sonship was proper only to the first Adam, that is, to the man created in the image and likeness of God, male and female. One should wonder and ask: Is it even tolerable to entertain thoughts that the body of the first Adam – called to anticipate, foreshadow and even pass on through Eve and his descendents the physical body that would be assumed by Jesus Christ, the new Adam, from the most glorious Daughter of Adam, the Blessed Virgin Mary – was not created directly and immediately by God with the utmost dignity? Can we honestly say, without offending the dignity of God the Creator, man the creature, and Jesus Christ the Son of God made man, that God made use of an evolutionary process of apes to form the body of the first Adam, a body which would also have had to have been essentially transformed into a human body? Man’s body from the beginning was imbued by its election in Christ; whereas an animal body is essentially different and inferior. Therefore, He did it: God created man directly and immediately de limo terrae with all of his sublime dignity as the first one predestined in Christ before the creation of the world to be a child of God (cf. Eph 1:4-5). And how could we conclude otherwise? We have seen that God could have created His initial masterpiece, Adam, with a view to His primary Masterpiece, Jesus, in just this way because He is God the Creator. Being all-powerful and having created the entire universe ex nihilo, there is no doubt about His capacity to have created Adam’s body without any evolutionary process or transformism. As the Psalmist writes, “Let all the earth fear the Lord, and let all the inhabitants of the world be in awe of Him. For He spoke and they were made: He commanded and they were created” (Ps 32:8-9). We also saw how this traditional view of the creation of man’s body was most becoming for God as Creator, for man as creature, and for Christ who was born of Adam’s race. In particular, the simplicity and potency of such a direct and immediate creation, besides corresponding to Sacred Scripture and Tradition, is more coherent and credible than the shady scientific theory of Darwin which becomes even more complicated when one tries to reconcile it with the deposit of the Faith through the outlandish theories of theistic evolution. How Adam was created by God should fittingly indicate the dignity of man and, at the same time, his contingency. The words of Tobias to God before taking his wife are clear: “Thou madest Adam of the slime of the earth, and gavest him Eve for a helper” (Tob 8:8). In creating Adam’s body directly and immediately from the elements of the earth we see man as being created in a special way, as existing in sui iuris. He was fashioned precisely to be God’s “image and likeness” (Gen 1:26) and the very nature of man required that his body be ordered to the soul, unlike the bodies of animals. As if all of this were not enough, the fittingness of such a creation becomes all the more clear when we consider the supernatural end of man’s body as “the temple of the living God” (2 Cor 6:20) and how it is ordered to the resurrection on the last day. In the end, knowing that Mary, the Immaculate Virgin Mother of God, and Jesus Christ, the eternal Word-made-flesh, would be born of Adam’s race, it is unthinkable that the formation of Adam’s body would have come about from a prolonged evolutionary process of brute beasts. If God formed the Body of the New Adam from the terra virgo of Mary’s immaculate womb without any intermediary process or cooperation – virginally –, then can we so lightly rupture the inspired parallel of Adam being created in view of Christ from the virgin earth of the first paradise? In conclusion, therefore, we see that all of the evidence points in favor of a maximalist view of the formation of Adam’s body directly and immediately by God from the earthly elements without any evolutionary process or transformation of an animal body to a human one. This requires supernatural Faith in what is revealed through Scripture and Tradition about man’s origins. When we profess our faith in the creation of Adam’s body de limo terrae we need not fear the discoveries and theories which science will bring forward. Faith and reason are not opposed and the truth will always shine forth in the end. Besides, doesn’t it takes a lot of “faith,” or better “convincing,” to believe that one day an ape went to sleep and, amazing grace, woke up the father of the human race? Indeed, the incredible assertions of creative minimalism are, in the end, harder to believe than those of creative maximalism. St. Augustine, De Genesi ad litt., IX, n. 32. Vatican II, GS 22 # 1.